The 10 best things to do in Labuan Bajo is our recommended things for you during in Labuan Bajo. The small town, Labuan Bajo always offers something different from other cities in Flores. The city is used to be the fishing town. Now Labuan Bajo is one of the travel destinations you have to visit. Visit Liang Ndara Village. This is a cultural village which consists of 3 villages such as Melo Village, Mamis, and Cecer Village. The most popular culture shown here is Caci Dance and Teti Alu. It is just about 45 minutes to 1 hour from Labuan Bajo. Visit Batu Cermin Cave or Mirror cave. This Mirror cave is located in Batu Cermin Village, Labuan Bajo - West Manggara. It is about 30 minutes from Labuan Bajo. Visit Cunca Wulang Canyon. Located about 30 minutes from Labuan Bajo, Cunca Wulang offer a spectacular outdoor activity. Here you can swim and jump. On the way to Cunca Wulang Canyon, you will see an amazing rice field and tropical rainforest. Goa Rangko or Rangko Cave. Goa Rangko is located on the Rangko village, it stays close to Batu Cermin, but you need to get on the boat as it stays on another island called Boleng. It is about 45 minutes from Labuan Bajo. Having sunset at Bukit Silvia. The best spot for having sunset in Labuan Bajo. It is about 15 to 20 minutes from the city. Having sunset and Nightlife at Paradise Bar, just 10 minutes from the city. It is a beachfront Bar which offers a stunning sunset. Sunbathing at Patai Pede. This is the only beautiful beach in Labuan Bajo open for public, you may have a day relax here. Visit Cunca Rami Waterfall. Need to have a quite strong physically as you will do walk for 20 minutes from the parking area. The Waterfall is located 25km from Labuan Bajo. You can get on a motorbike or joint our day tour to Cunca Rami Waterfall Tour. Taste Local foods or seafood at Kampung Ujung. This is the only place where you can find fresh local food and seafood in Labuan Bajo. Take a tour to Komodo island and beyond, choose one day tour or liveaboard, all you can do. To book and find out more about the Komodo island tours, you can go to the search box. Labuan Bajo, recognize as the small town fishing village in the West part Manggarai. Beside recognize as a fishing town, Labuan Bajo also offer the offer the tourist attraction. Now this small town becomes of the Indonesia popular destination and must visit. 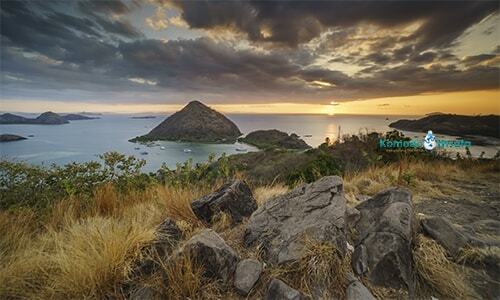 The Northside Labuan Bajo offer the breathtaking view. From Sylvia hill, it is a stunning seaside and the beautiful landscape. The best to spend here is for sunset, you can also do a morning bicycle. It is pure fresh air. The best to spend your day on beach activity is at Pantai Pede. This is the only beautiful beach open for public at the moment in Labuan Bajo. Known as the fishing town, Kampung Ujung offers the only best local seafood in the city. Due to the place located in the main fishing village, so everything seems coming fresh here. Price starts around IDR 60.000 for one medium fish wish with steam rice and juice. The price is quite affordable for the kind of small dinner. The place is open only in the evening from 07.00pm to 12.00pm. They can only serve you the local foods and seafood here. Getting to Kampung Ujung is not that difficult. If you stay in the main tourist object, turn to the Northside, walk for about 10 minutes. If you stay in the South Labuan Bajo such as at Jayakarta hotel, then you need to arrange the car. The drive is about 10 minutes to get to Kampung Ujung. As well if you stay on the Northside of the city, like in Plantaran or Ayana Resort. You need to arrange the car to get there. It is also driven for about 10 minutes.